Using a work positioner allows you to carve with both hands, which provides greater control and power. This positioner is simple to make with a few pieces of plywood and some hardware. To start, face-glue two pieces of 1/2″ (13mm)-thick plywood together or use 3/4″ (19mm)-thick plywood. Use the measured drawing to sketch guidelines on the plywood and cut the pieces to shape using a band saw, scroll saw, or saber saw. To ensure the parts align correctly, stack the two pieces of plywood together when cutting the hole for the ball and drilling the holes for bolts. Tape the pieces together and drill the three holes where indicated. To accommodate the bolt heads, use a Forstner bit to drill holes on the bottom of the base. Then, drill a hole that matches the outside diameter of the pipe in the center of a 21/2″ (64mm)-diameter wooden knob. Epoxy the pipe into the hole. Use a reducing bushing to attach the pipe to a 3″ (76mm)-diameter floor flange. Use a sanding drum to shape the inside of the base assembly to accommodate the ball. Run the bolts up through the bottom of the base, set the ball in position, and place the top over the ball. Secure the bolts with nuts to hold the positioner in place. Use a wing nut on one bolt to make it easy to adjust the positioner. Attach large workpieces directly to the floor flange. 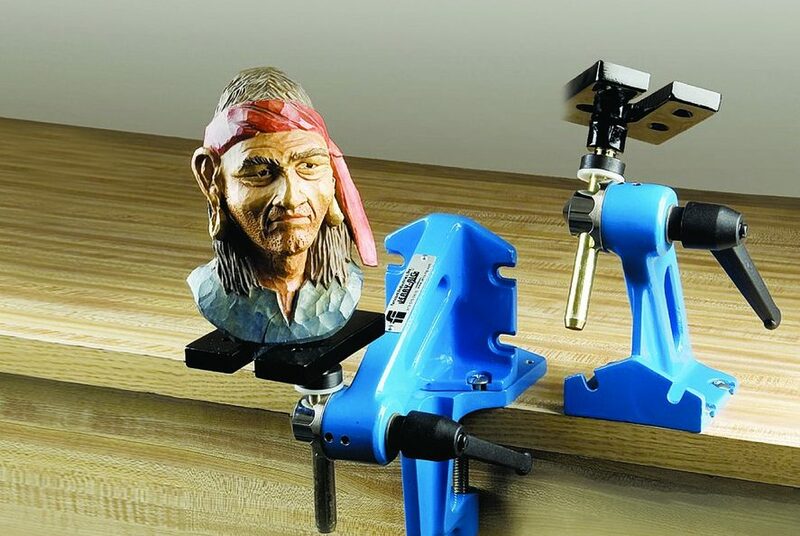 For small carvings, attach the carving to a piece of plywood, and then attach the plywood to the floor flange. CLICK HERE to download the Work Positioner Pattern.